Everyone who comes across the term head lice, pretty much has the same reaction of “Ewwwww” and immediate itching because he or she suddenly thinks they have a case of the creepy crawleys! Head lice is a most common skin ailment that afflicts children as well as adults, the young and the old. Lice doesn’t care what school or neighborhood you live in and affects all socioeconomic statuses. 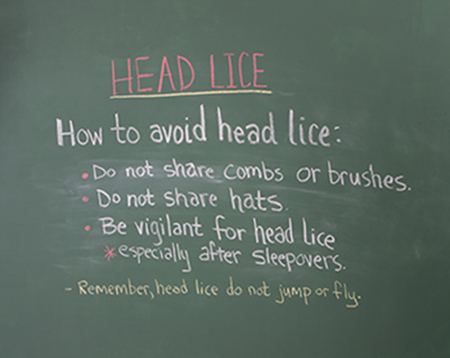 Now that it’s time for children to head back to school, here are some helpful tips so you can help minimize their chances of coming down with head lice. Head lice or Pediculus Humanus Capitis refers to an infestation of parasites which only feed on humans. The head louse itself requires feeding on blood several times a day and stays close to the base of the scalp to maintain its body temperature. Female lice lay their eggs or nits close to the scalp at the base of the hair shafts. As hair grows, the nits will move along the hair shaft going further away from the scalp. As lice do not fly or jump, they are transmitted through direct hair to hair contact with someone infested with lice by crawling. Less common means of transmission is through sharing of personal items such as hats, scarves, hair accessories and even hair combs or brushes where lice and/ or their nits (eggs) have travelled onto. Since we know transmission comes from direct hair to hair contact, we can put into place some actions to help reduce chances of infestation. Ahh, yes, children will play together and many times wrestle with one another, am I right? Children will also play with each other’s hair, combing, brushing, braiding or playing dress up and putting on clothing and accessories. Boys on a baseball team may share their caps or mistakenly wear another teammate’s cap. This is not uncommon. Explain to children not to share personal items such as hats, scarves, caps and headbands. Encourage girls who like to play with each other’s hair to brush only using their own brush and not to use the others interchangeably. Same goes for all hair accessories including hair barrettes, hairclips, head bands, head ribbon ties, bandanas etc. You can even send your child over with her own hair brush and accessories so she can have her own to use at her play date. If your child is old enough to understand, explain using simple terms what head lice is and how to minimize getting it. If your child is on a team that wears caps and uniforms such as a baseball team, teach your child not to share and wear one another’s cap or uniform. Write the names in the caps so they know which cap belongs to which player. I totally remember when this happened to one of my patients. A few members of her son’s baseball team came down with head lice from sharing baseball caps! Needless to say, they won’t be forgetting this experience anytime soon. Be proactive and perform head lice inspections every few weeks; more frequently if your child has frequent slumber parties or play dates. When inspecting the scalp, always check towards the base of the scalp for lice and nits. This is where lice like to stay as well as lay their eggs. Adult lice can be a few millimeters in size and can be tan to grayish white. Their nits are usually yellow to white, oval shaped and smaller than a millimeter. After play dates, clothing can be immediately washed in hot water and placed on high heat in the dryer. For items that cannot be washed or dry cleaned, place in an air sealed plastic bag for 2 weeks. If your child has been infested, contact your dermatologist for treatment instructions. Either prescription or over the counter remedies may be prescribed. It is important to follow the instructions exactly and for amount of time and if necessary to repeat and when. Once lice treatment has begun, all personal items, clothes, linens and towels need to be changed to new and never exposed clothing and personal items. Exposed clothing must be washed in hot water and exposed to high dryer heat. Leaving items unchanged can risk the chance of re-infestation even after topical treatment. Also, be sure to check the scalp again after treatment just to help ensure there aren’t any lice left behind. Always check the entire scalp focusing near the base of the hair shaft closest to the skin. If children or any other person in the household have complaints of intense itching that hasn’t gone away, you can never be too sure it isn’t a case of head lice and not just dandruff or dry skin! Listen to them and act accordingly. As parents, you can do your best to encourage your children on the not sharing of items and you can’t watch them all the time, but hopefully with these tips, head lice is one skin ailment you’ll miss this school season.